Binny Saandal | Yoga Kula. “Movement is the song of life” — My Yogaflowosophy is to teach with a passionate heart, to inspire people to take their practice beyond the mat into real life. My teaching style is playful and creative, and through rhythmic transitions from one posture to another, integrated with light-hearted analogies and yoga philosophy will leave you feeling both inspired and nourished. Each class ends with a guided shavasana to experience Santosha (inner bliss or contentment). I was born in India, where yoga and philosophy are a part of the culture that’s imbedded in you from an early age. My background as a practicing Buddhist integrated with yoga has helped me be the teacher I am today. 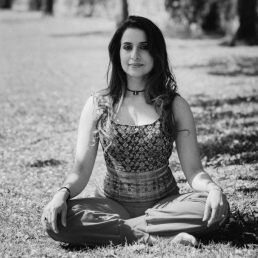 Although my yoga journey started in the mid 90’s, when a senior guru encouraged me to take this path, it wasn’t until a severe shoulder injury made me look deeper as I yearned for a practice that was more meaningful than just physical, energising and not all-consuming, lifting, yet grounding, that I found all my answers in yoga and here I am following my life’s goal. I’m a 200 E-RYT teacher from Yoga London, accredited by Yoga Alliance and I continue to pursue training as a 500 RYT to deepen my knowledge. I’ve trained under the guidance of many teachers such as KPJAYI level 2 yoga master Joey Miles and through the path of svadhaya (self-study). I teach a combination of different styles of yoga—from dynamic to vinyasa, power to functional, yin/restorative, Mandala and Lunar flows. I work with people from all walks of life, making my classes accessible to all.